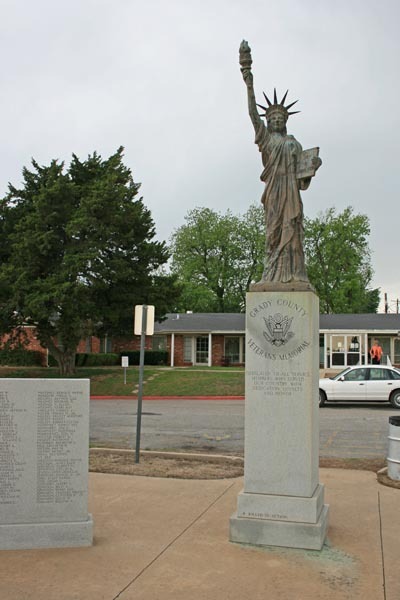 Chickasha is a city in and the county seat of Grady County, Oklahoma, United States. The population was 16,036 at the 2010 census. Chickasha is home to the University of Science and Arts of Oklahoma. This sister is located in Grady County Veterans Memorial’s plaza. around her are several memorial stones listing the names of fallen veterans from the county. There is no longer a Boy Scout plaque. We have not visited this site and we would be grateful for any images and/or information about the history of this sister. Please use our online form to submit your information. Image used taken by an unidentified motorcyclist riding on the Boy Scout Tour of Honor. Originally posted on passbagger.org and were taken on 5-3-2015.